Oh, and a new Apple TV cometh, too. Perhaps even more than usual in the moments before an Apple product launch, the tech world has gone straight crazy with rumors. Here’s why. A classic Apple teaser. But as almost everyone noted immediately, the fragment of screen in the image is shown in pretty good close-up detail…and the pixels in the icons are suspiciously small, with the font being curiously smooth compared to the iPad 2. 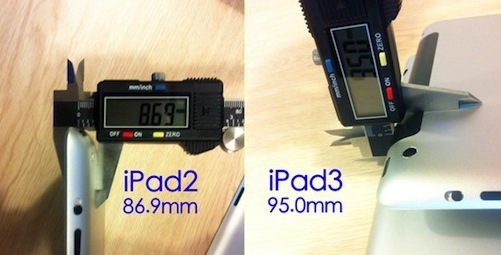 Is this confirmation that all those rumors of a super-high-res iPad with 1,536 by 2,048 pixels are real? Of course it is! It’s a brilliant move by Apple to maintain the iPad as king of the tablets with a display that surpasses pretty much every rival in terms of sheer graphical brilliance. Heck, it’ll even likely beat the laptop screen you’re reading this on. We knew it, you knew it, Apple’s doing nothing to hiding it. We’d heard many rumors the iPad 3 was going to be a bit fatter than the iPad 2, and recently leaked rear shells suggested this would happen as a mere deepening of the current shape. Now someone’s done the obvious thing and put a measuring caliper to these pieces of alleged Apple hardware, and yes–while they’re aesthetically almost identical, they mean the iPad 3 may be 0.81 mm thicker. That’s about three sheets of standard printer paper, or one tenth the height a hedgehog can leap on the forty-first Wednesday after Pentecost. We mean it’s really not very much, and you’re hardly likely to sense it when holding the thing. It’s hardly structural, and Apple wouldn’t cede its title of (one of) the thinnest tablets without a reason: It’s for a bigger battery, we’re guessing… one that’s chunky enough to meet the power draw of the new screen. Is it going to be powered by an A6 chip? An A5X chip? With two cores? With four cores? With a couple of super-powerful graphics cores bolted alongside? it doesn’t matter. As we pointed out, the smartphone world goes crazy about chip specifications in an attempt to give phone and tablet makers an almost meaningless marketing hook to tout at events like Mobile World Congress. But Apple tends to minimize attention given to its device innard’s specs. It only took the unusual move of talking up the original iPad’s A4 silicon because it was a big change for the firm, going with own-brewed chip tech for the first time. Expect Apple to only briefly deal with the AX chip inside the iPad 3. And you shouldn’t mind either–you can bet that Apple’s polished the synergy between hardware and software to a brilliant gleaming shine: The iPad 3 will perform very slickly indeed, and thus what makes it tick is irrelevant. Look again at that press image up the top there… notice anything? The icons are spaced in a way that means the iPad is in portrait orientation, but if so there’s a certain something missing from beneath those probing phalanges: The home button. Is it a goner, at last? Has Apple chosen to abolish it, ditching occasional unreliability and a point of ingress for dust and liquid into their tablet? It’s totally possible, and iOS has long offered a gestural alternative. But wait, it could be an Apple trick. Maybe the iPad’s upside-down in portrait mode, which would put the button out of view. Why would Apple do this? To hide a remodeled iPod connector port at the base of the device? It’s all speculation. We’re not betting on this rumor. More leaked info coming from China suggests Apple’s already busy shipping iPads around the world to key distribution points to enable an almost imminent launch date after next Wednesday’s big reveal. It’s completely possible, and we’re guessing something like availability inside a week in perhaps 10 nations (with a staged international rollout later). Apple could also surprise everyone, with Tim Cook suddenly touting an availability of “This Friday, March 9th” to a gasping crowd. That sort of supply chain supremacy is Cook’s expertise, after all, and it would certainly bump Apple’s stock price up higher–from its already astronomical altitude. One thing that could knock that stock price is Apple’s iPad 3 price. Another rumor suggests Apple may position it at around $80 more than the iPad 2 (an edition of which may, or may not, remain on sale as the cheaper entry-level offering). We’re dubious here, as it seems unlikely a Chinese supplier would have sight of Apple’s super-secret internal pricing decision. On the other hand, Apple may choose to do it. Meanwhile Apple may slide out a wholly new Apple TV alongside the iPad 3, say more rumors. It would be undoubtedly an up-specced device, sporting a faster processor, the ability to play full 1080p streamed video on HDTVs, and may include niceties like Bluetooth 4.0 for improved remote control options. Is it a full Apple Television? No. Is it possible? Very much so, as it’s long overdue. There’s much buzz that Apple will also overhaul its audio technology, powering iTunes and presumably its Macs and iDevices, to incorporate extra high-definition audio codecs under a “mastered for iTunes” label. Speak to a mastering engineer, and they’ll say there’s some merit to mastering a recording for the format it’s presented in (CD, or whatever) in order to optimize the sound experience for the listener…so mastered for iTunes makes sense. It would give iTunes an edge over some of its newer rivals, from Amazon to streaming services like Spotify. Will it come next week or at the iPod refresh event later in the year? Time will tell. Apple TV supplies are now said to be really clogged up, and not getting to resellers–which means there’s none of the old stock being injected into the delivery pipelines. That suggests one thing, usually: A new version is imminent. iPad Mini–this old rumor is getting a brand new lease of life, and this time it comes with a specific size: 7.85 inches for its screen. That would place it above the numerous 7-inch Android units, which it’s already likely to be distinguished from due to a likely 4:3 aspect ratio (like your old TV) compared to the typical widescreen format cheap tablets tend to adopt. It’s said to be a scaled-down iPad 2, and may come at a price tag around $350 when it arrives in Q3. iPad 2 in bite-sized 8GB. This is a fresh one, suggesting Apple really is keeping the iPad 2 on sale alongside the upcoming iPad 3. Flash RAM is pretty expensive, so by cutting internal storage down to 8GB and making use of over a year of supply-chain optimization (which will have honed the production costs down to marvellously small sizes) Apple may be able to offer the iPad 2 at a Kindle-rivalling price. 14-inch MacBook Air For Asia. A novel thought here, that Apple will diversify its MacBook Air line with a model sporting a screen around 14-inches across (compared to its existing 13.3-inch unit). We’re dubious. Apple Pushing For TV Deals. Apple’s again reported to be deep in negotiation with TV show makers and suppliers to secure content for a bespoke cable-rivalling TV business. It looks like Apple’s pushing for complete control, and may intend to launch channel-like Apps that collect together similar themed shows. If anyone can break the cable company’s rigid business model, it’s Apple. iPad Mini rumors get another spin today with a report that actually names names in Apple’s Chinese supply chain. Pegatron, a long.standing Apple partner, is said to be booked to assemble the 7.85-inch screen iGizmo and LG is said to be making most units of that screen–rather than Samsung. None of this is confirmation the iPad mini is a real thing, of course, but it’s worth noting that the last time rumors of this intensity bore names it pre-dated the Verizon CDMA iPhone. Meanwhile more rumors are being added to the pile about the iPhone 5. Countering claims that Apple would switch to a metal back for the iPhone 5, iLounge is now saying Apple’s pursuing a glass or ceramic back for the device. The design may be thinner than the iPhone 4S and also sport a larger screen. For these last two facts to be true, it would seem likely that Apple needs a stronger glass to span the larger area and also be thinner at the same level of strength. Lucky then that Apple’s recently confirmed that it does, as long suspected, use Corning’s Gorilla glass on the iPhone…and that Corning just revealed its Gorilla 2 product, stronger than the original. The iPad 3 may infact be the iPad HD say some, a new name to distinguish it from the limited capacity iPad 2 that’s expected to remain on sale. New iPads may be on shelves as soon as March 15th, nine days after tomorrow’s event and perfectly timed to sell over a weekend. Frantic air-freighting by Apple is apparently constraining supply chains for other companies trying to shift product out of China. An additional Apple event, probably of a smaller scale, is expected next week. It may be when Apple shows the updated TV, which is now in very limited supply. A new Apple TV, part number J33, is imminent and priced at $99. An updated Apple Care+ suite is en route for the iPad 3, priced at $99 with a $49 excess–but it covers accidental damage. A mystery accessory part, numbered B82, has shown up in Apple’s inventory–no one knows what it is, but it’s said to be priced at $39. It could be anything from a dock to a specialized cable to something unknown, but one intriguing guess says it may be an updated Apple Remote with built-in Bluetooth 4.0 for controlling the new TV. Since Bluetooth carries data, it could be a remote microphone to connect the controller to Siri in the TV unit. 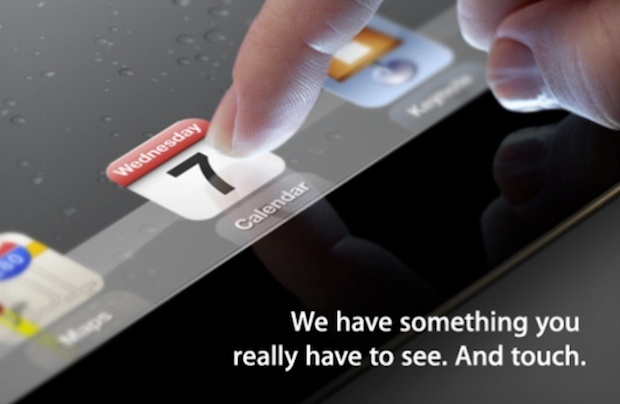 Meanwhile highly speculative rumors suggest the iPad 3 may have a secret apart from its high-res display: Haptic feedback. There’s been a couple of recent Apple patents that match this sort of technology, and Apple’s teaser in the press release did say they’d like the press to “touch” the new product.